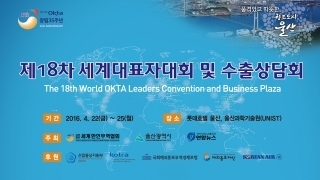 The 18th World OKTA Leaders Convention and the Export Business Meeting will be held at Lotte Hotel in Ulsan and UNIST from April 22 to April 25. Around 600 people will participate in the event, including 500 overseas Korean traders and 100 regional small- and medium-sized companies. The primary purpose of this event, organized by the city of Ulsan is to build a network with the overseas Korean traders to preoccupy foreign markets, increase exports, attract investment and create more jobs for the youth.